Please select this option when you want your powered blind fitted outside the window recess. The blind will be overlapping the window recess on both sides. 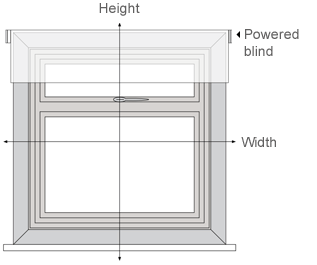 Please select this option when you want your powered blind fitted inside the window recess. Make sure that you have taken into consideration any window fixtures such as handles or locks or any other obstruction that could obstruct the movement of your blind. 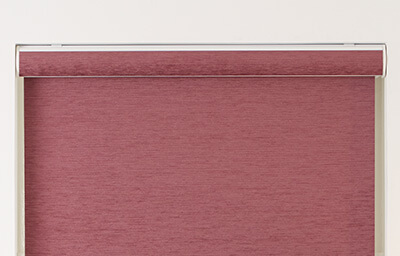 This system comprises of a slim line cassette profile, which covers the upper section of your roller blind. It also features a fabric strip, allowing you to perfectly match your cassette design with your blind fabric. This system consists of a cassette profile that completely encloses your blind's fabric roll. A fabric strip to match the blind fabric is supplied and spans the full width of the cassette system for a design that seamlessly blends together. This system is supplied as a standard roller blind assembly with a set of universal brackets securing the blind at each end. Our fully customised roller blinds are available in three different versions: as standard, open or closed cassette systems. 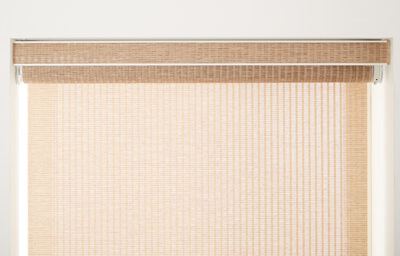 The standard system leaves your roller blind’s fabric roll uncovered and visible. 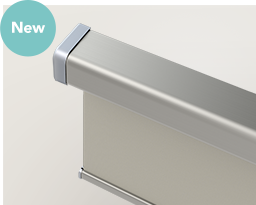 This system is supplied as a standard roller blind assembly with a set of universal brackets securing the blind at each end. As the blind motor requires power to operate, the motor position will determine where you must mount the battery or solar pack. The motor is positioned at either the left or right side of the blind, with the battery/solar or mains adapter typically located on the same side and connected in place. 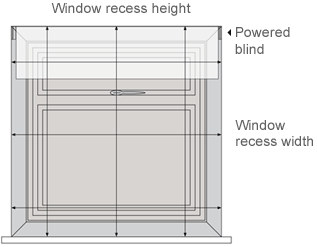 Most batteries are mounted directly below & behind the blind within the window recess (position 1) or above & behind the blind if outside the window recess (position 2). The battery pack can also be mounted vertically if preferred (position 3). 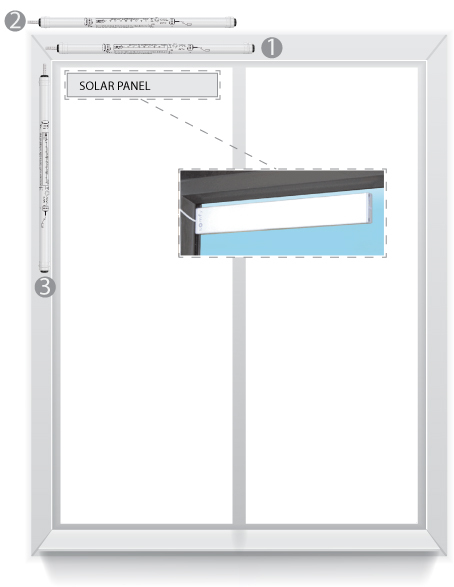 The solar panel fits to the inside window pane behind the blind (on the same side as the motor) and connects to a rechargeable battery pack, that can be mounted in positions as described in the battery pack section. A cable is supplied to connect the solar panel to the battery and motor to complete the power connection. The plug-in power pack provides a permanent power feed to the motor with the power pack taking power from a standard 230V socket outlet and the supply cable connected to the blind motor. The supply cable of the power pack is 3M long, so a socket outlet within close proximity of the motorised blind will be required. You may not want to select a power supply as an option during the order stage as you may already own a Somfy power supply that is compatible with the Somfy powered blind system. Your electric blind will not operate if you do not have a power supply connected to the motor. The plug-in power pack provides a permanent power feed to the motor with the power pack taking power from a standard 230V socket outlet and the supply cable connected to the Wirefree motor. Rechargeable battery pack for a Somfy WireFree powered blind. The rechargeable battery pack simply connects to the motor to provide the power supply. Once the battery power expires, simply disconnect from the motor, charge back up and reconnect for continued operation. NOTE: Battery charger supplied separately. Single battery pack for a Somfy WireFree powered blind. The battery pack simply connects to the blind motor to provide the power supply. The solar panel fits to the inside window pane and then connected to the rechargeable battery pack, which simply connects to the motor to provide the power supply. - Supplied with battery tube mounting clips. Somfy Rechargeable NiMH Battery Pack has the convenience of battery power with no requirement for wiring. When the rechargeable battery pack runs low, recharge back up with the rechargeable battery pack charger (supplied separately). - Battery tube mounting clips. The compact Somfy solar panel is designed to fit behind the blind on the inner window pane and continually charge the battery during daylight. The 12V rechargeable battery pack connects to the solar panel with simple plug in connector. The battery supply cable then plugs into the motor to make the power connection complete. Somfy Mains Plug-In Power Pack is a simple plug-in power pack that provides a dedicated power feed to the motorised blind. The power pack plugs into a standard mains socket outlet, with the supply cable connecting directly with the motor. This solution will require a socket outlet within 3M of the motorised blind. You are ordering more than one blind and have already selected a remote control. You may already own a Somfy RTS remote control that is compatible with the Somfy powered blind system. You would rather select a control by browsing through the accessories section of the site. You prefer using TaHoma or Connexoon. To establish a connection or to set the bottom, top and 'my' position, an RTS remote is necessary. Single channel wall switch in white. Ideal for controlling an individual powered blind. Battery powered (no wiring required). Supplied with a wall mounting plate. Raise, lower and stop functions (open, close, stop). Single channel remote control handset in white with grey trim. Ideal for controlling an individual powered blind. Supplied with a mounting pin (for wall mount option). Multi channel remote control handset in white with grey trim. Ideal for controlling multiple powered blinds individually and as a group. Channel selector button (5 channels). 6 channel remote control handset with timer function in a white finish. Ideal for controlling multiple powered blinds individually and as a group with the addition of timer control. 6 channel remote control with timer function. Supplied with a mounting bracket (for wall mount option). LCD screen and channel selector buttons (6 channels). - you are ordering more than one blind and have already selected a remote control. 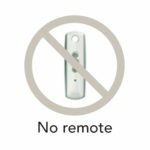 - you may already own a Somfy RTS remote control that is compatible with the Somfy powered blind system. - you would rather select a control by browsing through the accessories section of the site. Please note that without a control you can't operate the electric blind. - Battery powered (no wiring required). - Supplied with a wall mounting plate. - Raise, lower and stop functions (open, close, stop). - Channel selector button (5 channels). - Independent timer control per channel. 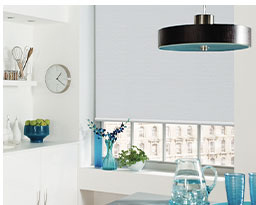 Magnolia Pipin is a blackout blind with a white backing that will go with so many different color schemes. 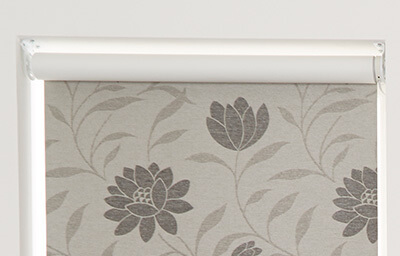 Our Magnolia range is available in 3 different colours to match all interior decors. 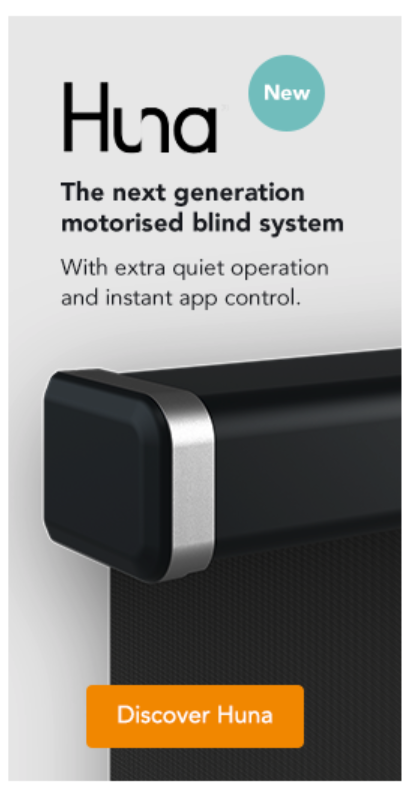 The blind is supplied as standard with Somfy motor and a choice of control options. Colours reproduced on screen may vary from the actual colours due to the limitations of the printing process. Great care has been taken to ensure that the fabric swatches and the information supplied are correct, however customers are advised to check the suitability of materials before use.. 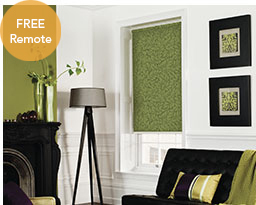 Fully customisable electric blinds are our most configurable blinds. Available in over 200 plain and patterned fabrics with three cassette options, they can be battery, mains or solar powered and paired with any of our control options including wall switches, handsets and timers. Somfy WireFree Roll Up 28 RTS motor. Integral radio receiver – secure and reliable Somfy RTS radio protocol. 30 cm supply cable to connect to the power supply. No remote (you may already have a Somfy remote at home). Somfy Smoove Origin RTS battery powered wall mounted switch. Somfy Telis 1 RTS Pure single channel remote control. Somfy Telis 4 RTS Pure multi (five) channel remote control. Somfy Telis 6 Chronis RTS Pure – multi (six) channel remote control with automatic timer and LCD screen. Somfy Lithium Battery Pack: This battery pack comprises of a Somfy reloadable battery tube, 8 x AA lithium batteries and battery tube mounting clips. Battery pack length/diameter: 430mm/20mm. Somfy Rechargeable NiMH Battery Pack: This battery pack comprises of a Somfy reloadable NiMH battery tube, 10 x AA NiMH rechargeable batteries and battery tube mounting clips (battery charger supplied separately). Battery pack length/diameter: 530mm/20mm. Somfy Solar Pack: The solar panel fits to the inside window pane behind the blind and connects to the rechargeable battery pack and motor. Supplied with adhesive strips to secure the solar panel to the inner window pane and battery mounting clips. Solar panel length/width: 301mm/41mm - Battery pack length/diameter: 530mm/20mm. Somfy Mains Plug In Power Pack - The plug-in power pack provides a permanent power feed to the motor. Plug into a standard 230V socket outlet and connect the supply cable to the motor. Supply cable length: 3M. Powered roller blind fabricated to your criteria complete with Somfy motor integrated into the roller tube. Standard roller system: supplied as a standard open roller assembly with universal top/face fix brackets. Open cassette system: supplied in a white slim line cassette profile complete with a fabric strip insert to match the blind fabric selected. Supplied with top fix spring brackets if fitting inside the window recess or universal brackets if fitting outside the window recess. Closed cassette system: supplied in a white closed cassette profile complete with a fabric strip insert to match the blind fabric selected. Supplied with top fix spring brackets if fitting inside the window recess or universal brackets if fitting outside the window recess. Power supply solution selected during the order process. The control selected (if applicable) during the order process. Instructions to guide you through the blind installation process from start to finish.